Thanks to Mimi for a great tour! Mimi is so knowledgeable about Chicago and brings the city to life! Totally recommended! Thank you! TOUR GUIDE RESPONSE: Thank you, Simon. It truly was my pleasure! TOUR GUIDE RESPONSE: Thank you, Simon. It truly was my pleasure meeting you and touring you around! This was our second tour with Mimi and just as wonderful as the first one. If you want to get to know Chicago, tour with Mimi. Her enthusiasm, knowledge and communication skills make her a terrific guide. TOUR GUIDE RESPONSE: Thank you, Joy. It truly was my pleasure! We would give Mimi a 6 out of 5 star rating if we could. She knows Chicago and has a passion for sharing it with people. She answered every question we had (2 adults, 2 teens). Even though we have been to Chicago many times before, we saw things we didn't even know about like the Chagall mosaic (The Four Seasons) in the Chase Tower Plaza. She also offered great advice about other things we should do and see while in the city. TOUR GUIDE RESPONSE: Thank you, Joy. So glad the kids enjoyed the tour as well. It was truly my pleasure meeting you all and touring you around! Please do let me know when you are back in town. Great tour by Mimi....who knew there was so much artistic endeavours here in Chicago. A very interesting and manageable trip around The Loop with advice for beyond. Fabulous! TOUR GUIDE RESPONSE: Thanks Genie. It truly was my pleasure meeting you & touring you around! Safe travels. Tours by locals on the first day in any town is such a good idea. Mimi F. was our tour guide in Chicago. We saw places that the everyday tourist would just walk by and not understand what they were walking by or know that there was something to be seen. It was a hot day and so Mimi had us in and out of beautiful hotel lobby’s throughout the day. Mimi is knowledgeable and easy to get along with. We felt like we were being shown around by a friend. Thanks Mimi! TOUR GUIDE RESPONSE: Thank you! It truly was my pleasure meeting you both and touring you around! We had a great time with Mimi. Because we had visited Chicago many times before, Mimi created a tour that showed us things we didn't know about and explored neighborhoods outside of downtown. Highly recommend - very enjoyable! TOUR GUIDE RESPONSE: Thank you Jan. It truly was my pleasure! Very informative, relaxed and interesting tour. Mimi was very knowledgeable about the city and its history. Highly recommended! Thank you. TOUR GUIDE RESPONSE: Thank you. It truly was my pleasure meeting you and touring you around! Mimi was incredible!! She helped us with getting a car and driver. She was flexible and made our trip better than ever imagined. Thank you Mimi!! TOUR GUIDE RESPONSE: Thank you, Todd. It truly was my pleasure! Mimi organized a wonderful customised Chicago downtown tour of 6.5 hours for us. She is super-knowledgeable about a city she clearly loves, particularly its architecture. Additionally, she is a lovely person who is fun to be with. Our lunch stop was perfectly chosen. Finally, she laid on brilliant weather for us! You are amazing Mimi! Thanks so much. TOUR GUIDE RESPONSE: Thank you Keith. It truly was my pleasure! Mimi was interesting, informative and flexible. The tour was great! TOUR GUIDE RESPONSE: Thank you! It was my pleasure meeting you both & touring you around. TOUR GUIDE RESPONSE: Thank you. It was truly my pleasure meeting you both & touring you around! We thoroughly enjoyed our two hour walking tour of Chicago with Mimi K. She was very knowledgeable and we saw and learned so much in the two hours. We would highly recommend Tours by Locals ( also used it recently in Vancouver ,BC) and Mimi. TOUR GUIDE RESPONSE: Thank you, Jen! It was truly my pleasure meeting & touring you and Tom around. Mimi's Oak Park tour centering on Frank Lloyd Wright is a good one, especially if you are interested in architecture. The visit to his home and studio was very educational and interesting. Mimi also shows you Wright designed houses in the very beautiful Oak Park. TOUR GUIDE RESPONSE: Thank you! It was great to meet you and it was my pleasure to tour you around. This was the second tour that we arranged with Mimi. I gave the first tour 5*. So why 3*? Only value for money. Mimi was just as 5*. We asked her to take us on this Frank Lloyd Wright tour and we greatly enjoyed it. However in the first 2½ of the 4 hrs we traveled by subway and had a tour for an hour given by a docent of the property, while Mimi waited, Then we had a slow walk through the neighbourhood with Mimi and the subway back. Our advice is definitely hire Mimi but choose another tour. TOUR GUIDE RESPONSE: Thank you. It was my pleasure meeting you and touring you around. TOUR GUIDE RESPONSE: Thank you Maya. It was great meeting you and touring you around Chicago. The pleasure was truly all mine! Our guide Mimi, was excellent!! Very knowledgeable of all aspects of Chicago. Very flexible always on time. Mimi provided us with three great days in Chicago!!! Thank you!! TOUR GUIDE RESPONSE: Thank you Jeff! The pleasure was all mine! Mimi was great! 5 out of 5. TOUR GUIDE RESPONSE: Thank you Rafi! So nice to meet you both and it was my pleasure. We had a wonderful tour of the Glessner house and discussion and walk around historic Prairie Avenue. Our tour guide was informative, pleasant and upbeat. We would enjoy taking another tour with her. TOUR GUIDE RESPONSE: Thanks, Bill. Glad you enjoyed your tour! My husband and I were in Chicago for short time. We had one evening open and we wanted to do a food tour. Mimi was wonderful in arranging a great tour with lots of Chicago favorites and a bunch of history of city as well. Plus, she is a very nice person, easy to be with! TOUR GUIDE RESPONSE: Thanks so much Jan. It was great meeting you both and it really was my pleasure! Our tour guide ,Mimi,was fantastic..It was a walking tour around the most important parts of Chicago. We could really appreciate each place and building that she showed us during the tour.she explained the art and architecture of each building of great importance and put the story of them in a way that it was fun. my wife and i will recommend Mimi very highly to all of ours friends in my country. I forgot, she took us to an amassing restaurant that had the best lamb shops i had ever tasted. Thanks Mimi . TOUR GUIDE RESPONSE: No, really, thank you Jose. It truly was my pleasure touring you & Olga around! So great to meet you both. All we can say is that we loved Mimi and she did an outstanding job!!! TOUR GUIDE RESPONSE: Thank you Lacy & Sheila for your kind words. It truly was my pleasure!! Great tour. Relaxed, personalized, informative, and beautiful. Mimi was a wonderful guide, knowledgeable, laid back, and very pleasant. 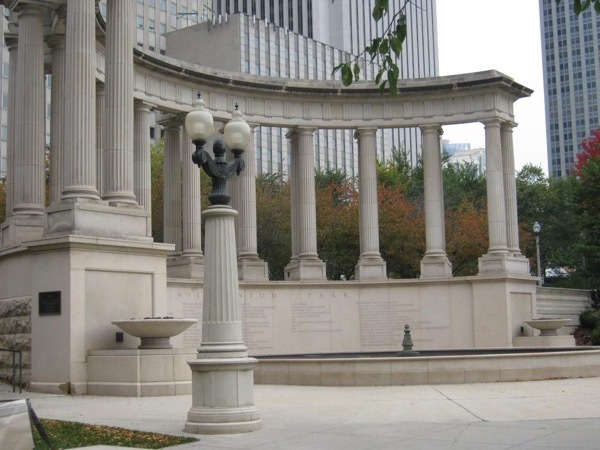 With her background in architecture and art and her long relationship with Chicago, she was able to give us detailed descriptions, complete with factual information and a few personal touches, of some of the city's premier landmarks. Mimi was also able to improvise on the spot, taking us to a building I happened to mention I wanted to see and one she had not planned on. TOUR GUIDE RESPONSE: Thank you, Olga, for your kind words. It was great meeting you & your Mom and touring you both around. It really was my pleasure! We had the perfect tour with Mimi to help us celebrate an anniversary weekend in Chicago. Mimi was so knowledgeable and had great insight from the moment we met in the hotel lobby and on the Green Line trip to Oak Park. A wonderful, small touch, was stopping by her favorite coffee shop en route to our tour. She took care of all of the details from transportation to tickets and we really enjoyed walking the neighborhood enjoying the architecture and her information. TOUR GUIDE RESPONSE: Thank you Shannon & Eric. It was my pleasure! I'm glad I could help make your anniversary celebration special. TOUR GUIDE RESPONSE: Thank you so much Bill. It was truly my pleasure to tour you and your lovely family around this great city. I'd be happy to show you more the next time you are back in Chicago! Being this was our first trip to Chicago, we wanted a tour that provided an overview of the Chicago. Mimi gave us exactly what we were looking and told us about Chicago's history and culture in an enjoyable 3 hour tour that included important landmark buildings, historical dates and people of Chicago's colourful past. Being a native Chicagoan, Mimi's passion for her city comes through with resounding excitement throughout the tour. We would absolutely recommend Mimi as a tour guide. TOUR GUIDE RESPONSE: Thank you so much Michael, it was my pleasure! So great to meet you both and hope to see you again! Such a fun time! Mimi is so friendly and easy to be with. The houses on the tour were amazing and the time sequence that they were built was very helpful. Riding the train to get to and from Oak Park gave us a very interesting slice of Chicago life we wouldn't have had if we were in a car! TOUR GUIDE RESPONSE: Thank you so much Becki, it was my pleasure! So great to meet you both. Mimi was a fountain of knowledge and took us to fascinating places we would never have known about. Armed with just one location request from us, Mimi used her initiative to walk us around central Chicago providing explanations of interesting buildings. Mimi is a natural guide, relaxed, enthusiastic and fun to be with, who could not have given us a better day.We met as strangers and came away friends. TOUR GUIDE RESPONSE: Thanks very much Andrew. It was very nice meeting you both and it truly was my pleasure! Let's keep in touch. This was a great tour - Mimi was very personable and knowledgeable about Chicago's architecture and history. We enjoyed the mix of old buildings, newer buildings, public art, spectacular interior spaces and outdoor spaces all within a few blocks of each other. It was our first visit to Chicago and we made an excellent choice booking this tour. TOUR GUIDE RESPONSE: Thank you so much Jennifer - it was truly my pleasure! I had a very nice time on Mimi's tour. It was just the two of us and I had a lot of fun touring Millennium Park, The Cultural Center, riding the L train and sightseeing the "bean", aka Cloudsgate. She and I also splashed like little kids in the Crown Fountain & did a little shoe shopping after seeing the Hilton Palmer House. We then visited a German neighborhood where she lives and gave me tons of history. We even did a little shopping in Gene's Sausage Shop and Delicatessen. It was fun and memorable! TOUR GUIDE RESPONSE: Thank you Lisa, the pleasure was all mine! I'm really glad you enjoyed the tour and hope to see you back in Chicago soon. TOUR GUIDE RESPONSE: Thank you very much Thomas. It was very nice meeting you both and the pleasure was all mine! Mimi was on time, full of good energy, knew lots of interesting things, and overall very professional. TOUR GUIDE RESPONSE: Thank you very much Merilou. It was very nice meeting you both and it was my pleasure! The tour was very intriguing with loads of interesting places and inside information about Chicago. Mimi, the tour guide has got a profound knowledge of the city and especially her neighbourhood, and with her enthusiasm and great personality she turned the tour into an unforgettable experience providing a perfect starting point for getting to know Chicago. TOUR GUIDE RESPONSE: Thanks Christian! It was really great meeting and hanging out with you too. Hope you make it back to the States soon!